FORREST CITY, AR (WMC) - The effects of multiple days of heavy rain is still being seen in parts of Arkansas. Between Friday and Sunday, parts of Arkansas saw an estimated four to six inches of rain. The rainfall is causing some major problems. St. Francis County Road 311 in Forrest City, Arkansas, collapsed due to flood waters. 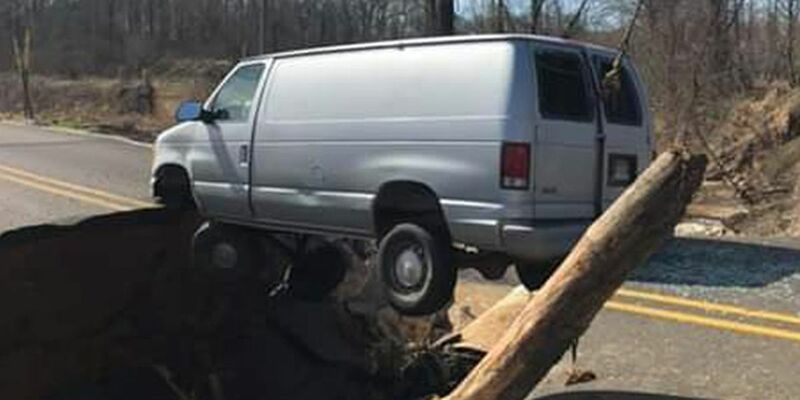 The roadway washed away as a white van was driving across it, leaving the van suspended only by its front and back bumper. The driver was injured, but has non-life-threatening injuries. The road is closed until further notice. Farther west in Jackson County, about 30 residents near Newport are being advised to evacuate with the concern that an eroded levee may fail. If the levee south of Highway 224 fails, water could flood south toward Woodruff County and could back up Highway 14 and Highway 17. An emergency has been declared by a Jackson County judge, but it is only voluntary. Crews will be giving out sandbags Thursday at the Erwin Fire Department.